This sentiment is explored in several of Obayashi’s films, but made literal in “The Discarnates” (異人たちとの夏, 1988), which marked his return to the ghost story for the first time since “House.” Typical of an Obayashi picture, the director’s desire to unpack his own thoughts on nostalgia supplants the expectations one would usually have for a horror film. Though it does have a couple of jump scares and a bloody operatic climax, “The Discarnates” hews closer towards the films of Yasujiro Ozu or the Tora-san series rather than the gore fests of Wes Craven or Rob Zombie. The story revolves around a middle-aged TV writer, Hidemi Harada, played by Morio Kazama. A misanthrope in deed and thought, Hidemi is shocked to run into his dead father (Tsurutarô Kataoka) one night while taking in a vaudeville show in his old hometown. Hidemi’s father doesn’t bat an eye at the situation, dragging his son outside and back home to meet Hidemi’s deceased mother. The sudden family reunion at first disturbs Hidemi, but he quickly overcomes the bombshell and accepts the situation for what it is: a dinner with his dead parents. Of course, when morning comes Hidemi isn’t quite certain what he experienced, so he goes back to the spot and finds his parents there again. From that moment forward Hidemi no longer questions what’s going on and just enjoys having his parents back in his life, having lost them at a young age. Their influence is so significant that Hidemi’s taciturn demeanor starts to crumble and he soon sparks up a relationship with his lonely neighbor Kei (Yuko Natori). Before Hidemi can have that happily ever after ending, a strange sickness comes over him and discovers that his body is slowly transforming into a decrepit old man. Obayashi calls into question the notion that a person can substitute reality for a fantasy of the past. It’s a telling detail that whereas the scenes in the “real world” are shot in dark depressive blues and unflattering white, the scenes in the “spirit world” have a bright warm tone. The relaxing family scenes may make you ache for that kind of relationship with your own parents, or think that the director supports the notion that a life trapped in your past is far more fulfilling than reality. However, Obayashi slowly introduces a couple of key details that demolishes this sentiment. Aside from Hidemi’s decrepitude, the director condemns the abuse of nostalgia by characterizing Hidemi’s desire to continually return to his parents’ home in the way cop dramas portray drug addicts. Without his daily fix, Hidemi becomes agitated and scornful of anyone that dares criticize him. His continued visits to his parents are happy, but they also leave him feeling regretful and depleted. Obayashi makes it plain and clear that for Hidemi to cure himself of his addiction he must go cold turkey and start living in the present. This plot point stands in stark contrast to Kei, who suffers an utterly tragic fate by story’s end. 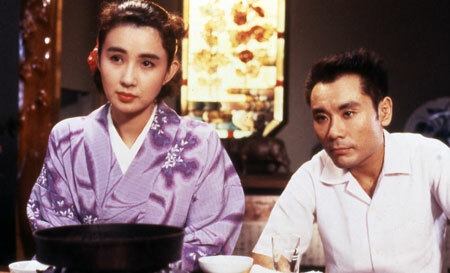 Unlike Hidemi, she attempts to live in the present but cannot, for very obvious reasons that are revealed at the film’s climax, unshackle herself from her past. Obayashi cleverly foreshadows the painful end of their relationship through the leitmotif of Puccini’s “O Mio Babbino Caro,” which is played constantly throughout the picture, but especially during scenes wherein Kei and Hidemi are together. The aria’s libretto, which encompasses a young woman’s pleas to her family to not to separate her from her lover are paralleled by Kei’s struggle to keep Hidemi from being lost to her because of his family. For the Obayashi novice, “The Discarnates” will probably befuddle since it lacks the rat-a-tat excitement of his earlier work. However, the film will reward those who come into the screening without any preconceived notions. Obayashi’s unique sensibility and the use of ghosts as a metaphor for how nostalgia can chain us to our past is profound in a way that few films are. “The Discarnates” will screen on Sat., Dec. 5 at 7:00 p.m. as part of the Japan Society New York’s Nobuhiko Obayashi retrospective this year. For more information, visit www.japansociety.org.